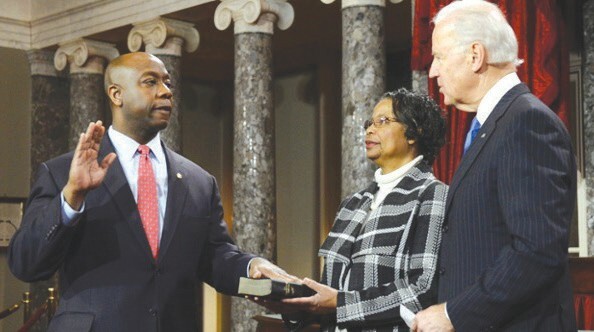 Republican Senator Tim Scott from South Carolina in a swearing in ceremony, with his mother Frances and vice president Joe Biden. Senator Tim Scott of South Carolina made history in Washington as he was sworn in as the first black U.S. senator elected from the South since Reconstruction after the Civil War. The Republican lawmaker was sworn in on Tuesday at the U.S. Capitol. Scott has served in the U.S. Senate since January 2013. He was appointed to the post by Gov. Nikki Haley after Jim De- Mint resigned. Last month, Scott was elected to the remaining two years of DeMint’s term. In doing so, he also became the first black to win a statewide race in South Carolina since the Reconstruction era. Scott faces re-election to a full term in 2016.